ON January 12, 1918, two British warships were wrecked in a blizzard on rocks off the Orkneys. Of the 189 men on board, only one survived. Indeed, as the ships were smashed up by the seas, only 55 bodies could be recovered for burial. 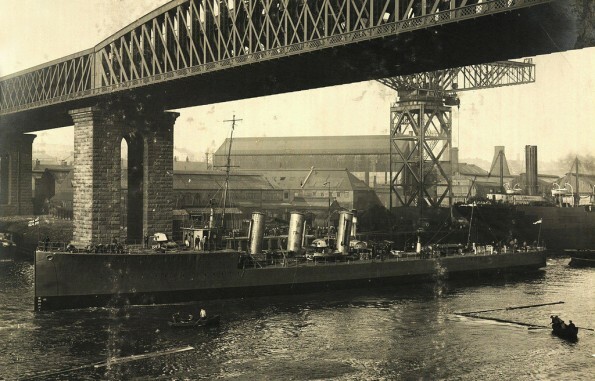 Following the report of the commemorations of the centenary of the disaster in Scotland this month, Anthony Magrys, of Darlington, draws our attention to the fact that two of the sailors who died that day were from the town. Indeed, another two hailed from County Durham. On that horrible night, HMS Opal and HMS Narborough were patrolling the North Sea, searching for German mine-laying ships. As the snowstorm blew up, visibility reduced to zero and the waves became so large, the warships were in danger of being swamped, so they were ordered to return to Scapa Flow. The one survivor told how they slowly sailed side by side, in constant communication, until they simultaneously ran ashore due to a catastrophic navigation error. Able Seaman Francis Gill Cowing was one of the 188 who died. He was 24, the son of a railway engine driver who lived in Pensbury Street, Darlington. Before the war, Francis was employed by the North Eastern Railway as a carriage oiler/wagon greaser – perhaps these skills meant he was in the engine room of Opal when it was destroyed. He is remembered on the memorial which was in Eastbourne Methodist Church – just up the road from Pensbury Street – and is now in St Herbert’s. The other Darlington victim was 1st Class Stoker Herbert Christie, 28, of Oaklands Terrace, off Easson Road. He, too, had been a railwayman – a plumber in the NER engineers’ department – and was married to Christina. He left two children, and is remembered on the memorial in Holy Trinity Church. We should also note that two 2nd Class Stokers, Robert Farwell of Burnhope, near Lanchester, and Alexander McPhee, of Annfield Plain, also lost their lives. None of their bodies was recovered.